I did it.. I decided that I was going to tackle the powder room. Honestly, this is probably not the project I should be working on. 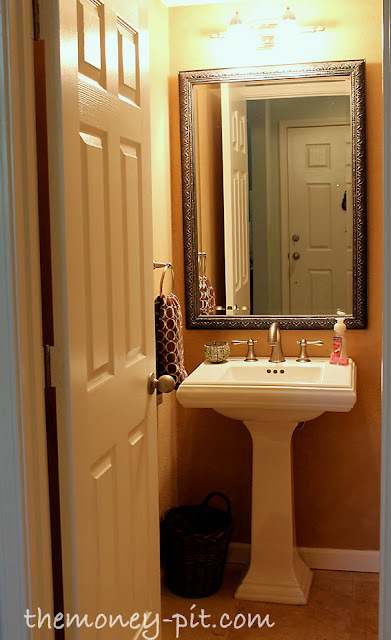 I have rooms in my house that are WAAAY worse than the powder room (like the master bedroom and bath) but nobody really sees those. 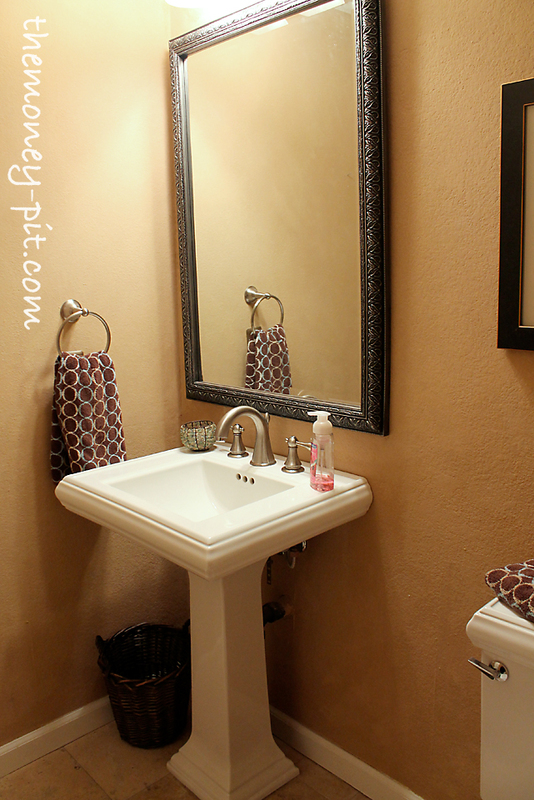 The downstairs powder room is the one room that visitors use and see on a regular basis and I am dying to update it. Ironically I didn't take any pictures of it on move in day (like I did the rest of the house) because the previous owners had updated it (removed the oak vanity and put in a pedestal sink) so I thought I would be able to live with it. I hate the paint color and the fact it is a "faux texture" paint that is supposed to look like suede. It is all blotchy where ever a hole has been patched and attracts dust like a bad mamma-jamma. Becuase of that I didn't even want to add new nail holes so I hung the artwork on the nails that were already there and so they aren't even. Ugh. The popcorn ceiling is gross and whoever painted it last must have been assisted by drunken monkeys because they did a TERRIBLE job. But the biggest problem is that it is BOOOORING. It does have some things going for it. I love the style of the sink and matching toilet, plus it has a brand new travertine tiled floor. The light fixtures are okay (at least they aren't brass) but the overall style is only "okay." Of course hanging out on Pinterest got me all fired up to re-do it. And so here I am. I thought I would share some of my favorite ideas and hopefully I will be able to incorporate some of them into the new powder room. I want to keep the artwork and towels the same as well. The idea here it to change the look of the room without buying much other than paint and molding. I am not sure exactly what color I am going to go with at this point. That will be the biggest impact changer, but I am still undecided. I really liked the bathroom before but once I read your ideas, I can't wait to see it! I know it'll be awesome. I'm impressed that you're willing to take on the bathroom labor yourself. Way to go! You rock! Hey Kim, I'm glad I saw this today because I wanted to tell you since you don't like the texture on the walls, you can smooth it out, but it takes some work/time. But it's really cheap. Just go to home depot and go to the drywall aisle and get a box of westpac all purpose joint compound. It's under $8. And buy yourself a spatula to smear it on the walls to smooth it out, should only be a couple more dollars. So that's a really cheap way to get rid of the texture on your walls. If you don't want to do the work, then no worries, just wanted to let you know about it. Kyle and I used that to smooth all the walls in our entire house. 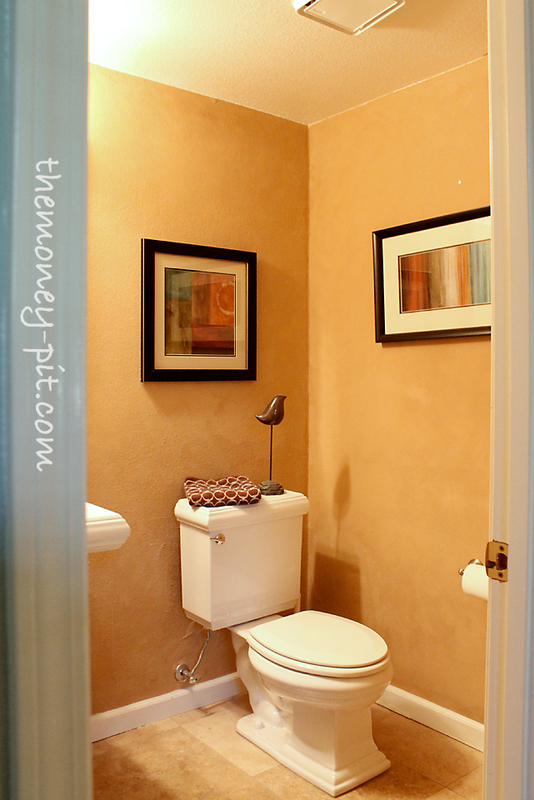 Yes it takes work, but the walls were so nice a smooth and pretty when we were done. Oh yeah and if you do that, you need to sand it between coats. Then sand it again and clean the walls of any dust before you paint. 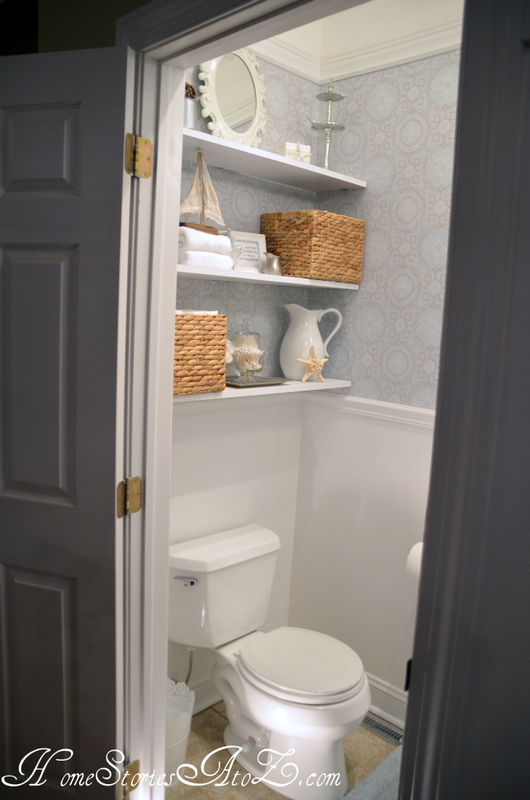 I really like the ideas you have for your powder room! I like the moulding going halfway up the wall like wanescoting.